This Video Of Twinkle Khanna On Akshay Kumar Starrer ‘Padman’ Will Tell Us Why It’s A MUST Watch Movie! Bollywood actor Akshay Kumar is known to deliver strong and content-oriented films. Once again, Akshay is coming with yet another film that is a taboo subject in Indian society, sanitary pads! Akshay Kumar’s last outing, Toilet: Ek Prem Katha addressed the social issue of sanitization. Now, Padman is the next step in social awareness. 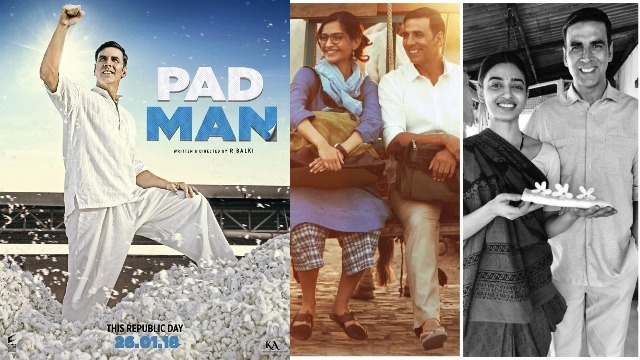 Akki deals with the topic that deals with the society and ‘Padman’ is that one story that needs to be told. Read: Is Akshay Kumar’s ‘Toilet: Ek Prem Katha’ A Relevant Film For Everyone To Watch? Let Audience REVIEW Decide! But this time, Akki’s wife Twinkle Khanna is also a part of the film as a producer. Yes, Padman makes Khanna’s debut as a producer. ‘Mrs Funnybones’ has chosen this film for quite a few reasons. One of the reasons for choosing to make a film like ‘Padman’ is because it tells a story of a man Arunachalam Murugunantham, who is from a small town in Tamil Nadu. He was the one who invented affordable sanitary towels and to raise awareness in rural areas. It was an inspirational story that got her onboard for ‘Padman’. Why Murugunantham’s story is so important to let the world know about it? Because it is the only way to reach households in both urban and rural India. It will begin a conversation about something that so far has been wrapped in newspaper. Twinkle Khanna is surely a proud woman for making her production debut with a biopic like this. Recently, Twinkle Khanna also appeared on BBC World News to discuss the affordability of sanitary pads and issues around Menstrual Tax. “I don’t regret any part of this journey, even the brief stint as an actress where my meager brain cells were probably rather busy trying to commit hara-kiri in despair, because experiences add to your abilities, even if it is just your ability to laugh at yourself. I am looking at interesting stories for my next project, but first I have to make sure that my superhero ‘Padman’ takes to the skies,” said Twinkle. Hopefully, Padman will bring attention to something that has been shamed for a very long time. Helmed by R Balki, ‘Padman’ also stars Sonam Kapoor and Radhika Apte. The movie is slated to release in cinemas on 26th January 2018, it’s a Republic Day in India. Next : Fashion Roundup: Selena Gomez’s 11 FAB Outfits Of The Year Which We Loved The Most!